Tahl Raz: Well, let’s bring this down to a place where we can really apply it and people can see how it functions in their work. For instance, I know that in your work with poker players you say you can sit in observing a game, even on television, and tell whether people are bluffing or not. And that obviously, if you can do that more than the average poker player, there’s something for them to learn there. For business people, what have you seen in dealing with them and teaching them in your interactions with them where some of this stuff comes up and their greatness weaknesses lie? Because they just haven’t been taught to read or process any of this? Joe Navarro: One of the biggest issues that I see is that you go through graduate school and undergrad school and nobody really teaches you how to observe. So, then you get hired by a company and they say, “Well, go do due diligence” … all right so, I ask questions? That’s not good enough. It’s how people react to questions when you’re conducting this due diligence. 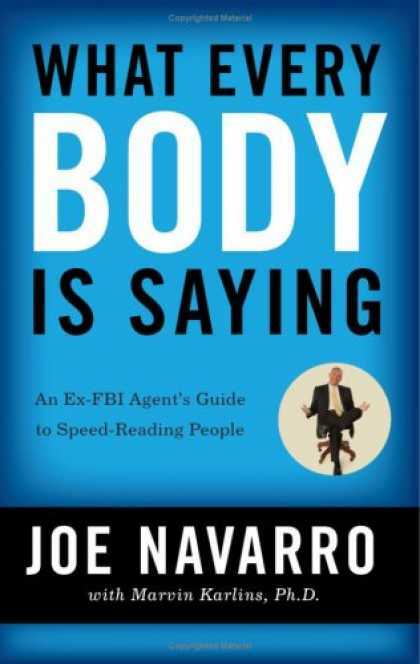 Quite often people wait till well, when I’m in my job I’ll wait to observe people and I’ll learn to pick up on body language or when I graduate from college or when I go to the new job, that’s when I’ll begin to focus on body language. Well, the fact is it’s too late. You’ve got to start right now because there’s no such thing as dating body language, work body language and as you said poker body language. Our limbic brain doesn’t work that way. It deals with threats and it deals with comfort and discomfort. So, the displays that we want in leadership of high confidence well, those are non-verbal. When we look at a leader and we admire how they lead one of the things that stands out is they’re non-verbal. They command the room. Their gestures are smooth. Nobody likes an erratic person. We lose respect for anybody that has jittery gestures and they’re just all over the page. So, when we look at somebody like Colin Powell … my God, the man comes into a room—he dominates the stage. His gestures are smooth and we know he’s a leader, we want to follow him and he hasn’t even spoken to us yet. So, you begin to appreciate the power of non-verbals to really influence others. Because you don’t walk into a room and say, “Hi, I’m here to influence you.” We are influenced we are seduced by very subtle things. So, it doesn’t matter what profession you’re going into. We’re basically dealing with people. I tell business people, “You’re in the same business I was in, which is two things you do every day that I did—you observe and you communicate. And if you fail on one or the other you will fail in your business. You will fail in your enterprise because if you can’t observe changes, if you can’t observe how people react to what to you and what your message is then you don’t know how to communicate.” And interpersonal communication is anywhere from 70 to 80 to sometimes 90% non-verbal communications. Then, we see how important the non-verbals are to your success. Tahl Raz: Let’s do a mini case study here of that kind of idea. I mean I think that some people think of non-verbal communication and immediately they just focus on the idea of picking out whether someone is lying or not. But in fact, you say … and it’s persuasively … if you understand these cues and how people receive them you can actually modify your own behavior. So, in terms of maximizing your influence in a first encounter with … our case study is John Smith. Tahl Raz: You helpfully break down influence into two categories at a distance and up close. Tahl Raz: So, let’s start at a distance and we’re meeting someone … an important meeting for the very first time. What should we be concerned about? What are the variables at a distance to convey that sort of leadership to start maximizing our influence?